Wednesday June 14 1911 Mother a bad night. I did not go to sleep at all. Hattie wanted me to go talk to Dr Smith. I did in afternoon and then over home where I stayed till 4.30 Mother out in the yard in afternoon. Last day of [Commencement?]. Thursday June 15 1911 Was busy all forenoon with dinner. C.J. Neal was here for dinner. I slept after he went away and went down home to stay all night. They have talked the matter over and decided to have Dr Smith come. 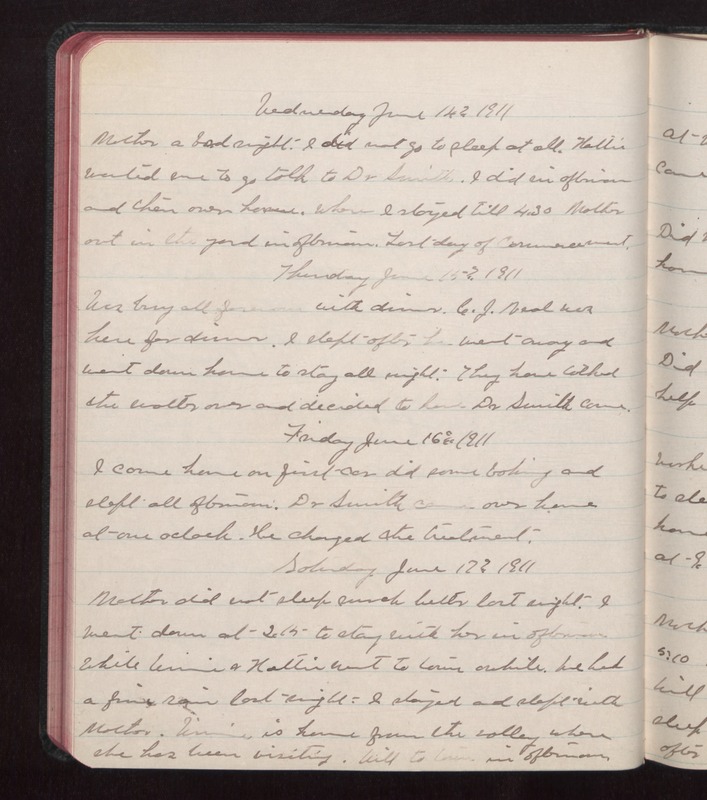 Friday June 16 1911 I came home on first car did some baking and slept all afternoon. Dr Smith came over home at one oclock. He changed the treatment. Saturday June 17 1911 Mother did not sleep much better last night. I went down at 2.15 to stay with her in afternoon while Winnie and Hattie went to town awhile. We had a fine rain last night. I stayed and slept with Mother. Winnie is home from the valley where she has been visiting. Will to town in afternoon.